Instructions: Using the above image or link above, make a "top ten" list of the words you struggle with the most. Look up in the dictionary and copy out their meanings. Write a paragraph attempting to use ALL the words correctly (both forms). Be prepared to share your work. 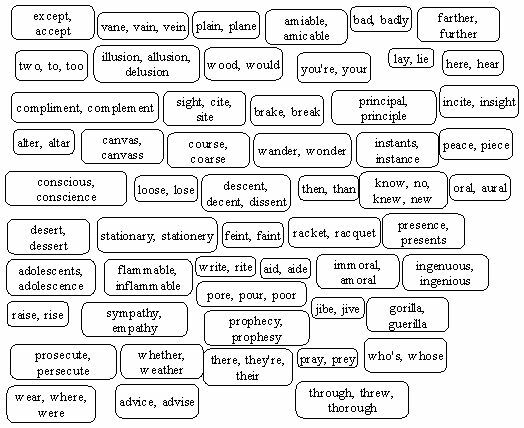 (image) "Joylene Nowell Butler, author: Commonly Confused Words." Joylene Nowell Butler, author. N.p., n.d. Web. 23 Feb. 2012. <http://cluculzwriter.blogspot.com/2011/09/commonly-confused-words.html>.